eating the third star in Orion's Belt. Hey! Remember that time Arsenal beat Bayern Munich! That was pretty cool, right? Since losing to Olympiacos, Arsenal have won three on the bounce, each in a different but still impressive manner. They shellshocked Manchester United out of the gate. They outlasted a hard-working Watford side. They defended well against all of Bayern's possession and punished the German champions on the counter. That's three wins by a combined 8-0 scoreline since that setback against the Greeks. Of course, none of that really matters if Arsenal starts dropping stupid points domestically. 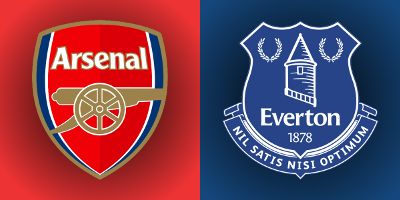 The Gunners welcome a struggling Everton side to the Emirates in tomorrow's evening match; the Toffees are coming off a 3-0 home loss to Manchester United, so, by the transitive property, Arsenal should expect to win 6-0? Ah, but it's never that simple. Everton are 9th in the league right now and will want to bounce back from their listless showing last week. Facing an in-form Arsenal side is not exactly what the doctor ordered on that front, but it's not like Arsenal are thinking "oh great, Everton!" when examining their opponent. Arsenal have to keep their great form going, so another home result here is paramount. And he had just remembered how to score, too! The bad news from Arsenal's win on Tuesday is the injury to Aaron Ramsey, who left with a hamstring injury. That'll leave the Welshman out for at least a month, meaning he will miss the trip to Munich as well as the North London derby. Best case, he'll be available for the match against West Bromwich Albion on November 21. Alex Oxlade-Chamberlain should take his place in the XI. Meanwhile, David Ospina is expected to be out until the next international break as well with a shoulder injury he picked up while with Colombia. The average Arsenal fan's opinion of Ospina obviously dropped after he, well, dropped that ball into the net against Olympiacos; however, with Wojciech Szczesny and Emiliano Martinez out on loan, it is 21-year-old Matt Macey who is deputizing on the bench. Macey could start Tuesday in the League Cup against Sheffield Wednesday. In other news, what is going on with Gabriel? There have been rumors he needed minor surgery for something, which, in Arsenal terms, could mean anything. I'll just leave him in the "doubts" category for now. Jack Wilshere, Tomas Rosicky, and Danny Welbeck all remain strictly in the "like a new signing in the January window" category. Predicted XI: Cech, Bellerin, Mertesacker, Koscielny, Monreal, Coquelin, Cazorla, Alexis, Ozil, Oxlade-Chamberlain, Walcott. 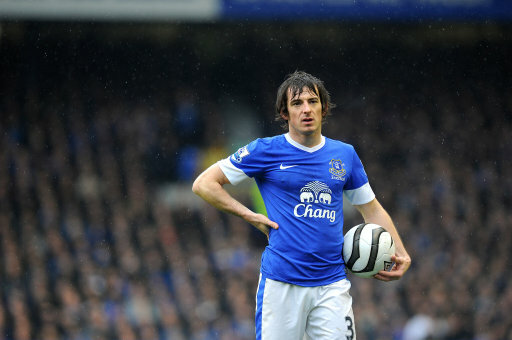 Leighton Baines, is out with an ankle injury. Everton have struggled all season with injuries to their defense; to that end, Leighton Baines remains out until November with an ankle injury. On the other hand, Seamus Coleman is now back after a month-long layoff, while Phil Jagielka is back from an injury as well. Tom Cleverley is recovering from ankle surgery and is 50/50 to return. Tony Hibbert, Steven Pienaar, and Muhamed Besic are all out. Manager Roberto Martinez usually sticks to a 4-2-3-1 formation, but has been known to surprise Arsenal with alterations to that formation; guessing how the Toffees might line-up for tomorrow's match could be simultaneously well-informed and totally wrong. It's the winger positions that leave the most open questions, as Martinez can choose from Aaron Lennon, Gerard Deulofeu, Arouna Kone, and Steven Naismith. Predicted XI: Howard, Coleman, Stones, Jagielka, Galloway, McCarthy, Barry, Barkley, Naismith, Deulofeu, Lukaku. Petr Cech has a four game winning streak of his own. Arsenal's roller-coaster keeps on rolling up the track. The Gunners have won three straight across all competitions for the first time this season; it's their longest winning streak since a nine match run last spring (if you want to get really technical, you could say that winning streak was eight, as the final match was the FA Cup Semi-Final against Reading which required extra time.) Arsenal did not win three straight across all competitions last season until November 1, so this year's club have made some progress on that front! Last year, the Gunners only reached four straight wins across all competitions on two occasions; they were shunted at three on the bounce three times. Everton have had a topsy-turvy season, alternating results all year. They opened the season with a draw, a win, and a loss, then required extra time to defeat Barnsley in the League Cup. After another draw, they won, then drew again, won twice (one of those in the League Cup,) drew their cross-city rival Liverpool, then lost 3-0 to Manchester United last weekend. Everton lost consecutive fixtures in the league three times last year, including a four match losing streak around Christmas. Arsenal won this fixture 2-0 last March. 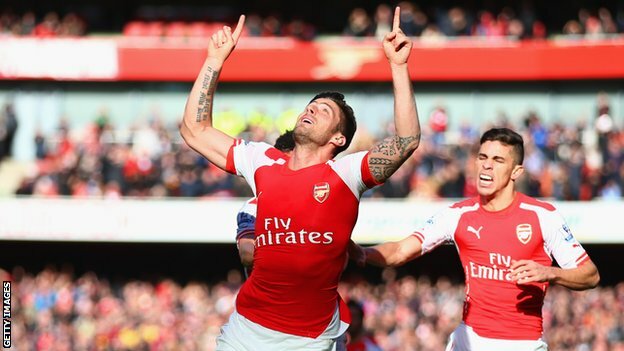 Olivier Giroud scored in the 39th minute, while Tomas Rosicky made the points safe in the 89th. The victory was critical, coming just days after Arsenal lost to Monaco in the first leg of their Round of 16 Champions League tie. Arsenal took four out of six points from Everton last year; in the reverse of this fixture, Arsenal came from behind to draw 2-2 at Goodison Park. Everton are winless in their last 21 trips to the Emirates/Highbury, dating back to January 20, 1996. Prior to last season's loss, the Toffees had taken draws from the previous two league encounters at the Emirates. They've also drawn four of the last nine league meetings in London. Is this from Reservoir Dogs? This is the first time Mason will work an Everton match this season; last year, Everton saw Mason three times, winning one, losing one, and drawing one. If there were another way for a match to end, maybe they would've found a way to get that, too. They drew Sunderland 1-1 last November, lost 1-0 to Stoke in late December, and beat Southampton 1-0 in April. Lee Mason worked this fixture during the 2010/11 season and had a bit of a nightmare when he allowed a controversial opening goal for the visiting Toffees; Louis Saha scored from a seemingly offside position, but was deemed to have been played onside because the through ball clipped Laurent Koscielny. Arsenal came back to win the match, 2-1. John Painting is a contributing writer to the Modern Gooner and hails from Mintaka, the third star in Orion's Belt. You can follow him on Twitter @zorrocat if you'd like to learn some Mintakese.